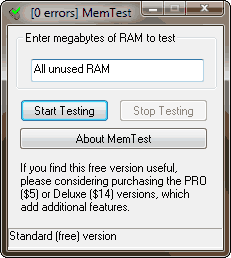 MemTest tests the RAM on your system to evaluate your computer memory's ability to store and retrieve data accurately. This is a useful test to run on a new computer, when you install new or additional RAM, or overclock your machine. How to extract: Download the ZIP package and extract to a folder of your choice. Launch memtest.exe. Added /alarm command line option. Notice error in description. Website says it will work on Vista and Win 7. How do you update whenever the software developer indicates that package runs on newer OS platforms?